Thanks to a donation from Rotary Club Eiksmarka in Norway, the water supply system in Kisenyi, Rubirizi District, was extended to the local primary school and health centre. A small water tower was constructed just behind the health centre in order to provide the additional pressure required. 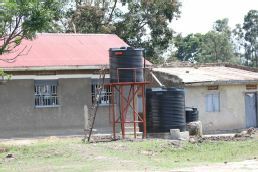 The tank on the ground next to the tower is an old rain water harvesting tank which gives the health centre some additional water for free. In addition to the construction works, considerable efforts were put into training the local water committee which is running the project. They needed technical training on how to operate the new extension, but also how to manage the collection of payments. Fontes Foundation will monitor closely the operation of the extension to help the committee run it and the rest of the system properly. Two separate lots of students successfully completed their Short Courses in Computer Skills, English and Basic Literacy, Music Dance and Drama (MDD). 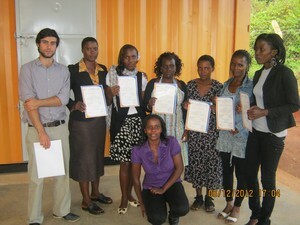 A total of 39 students completed the courses. The graduation ceremonies took place on 20th September and on 6th December, 2012 respectively. During the ceremonies students were awarded certificates and guest speakers expressed their excitement about the initiative and encouraged the youths to stay focused and utilize the knowledge and skills productively. The third lot of 29 students for the short courses was enrolled and started classes on 10th December 2012 and will complete early 2013.